Registration dates announced for children who will begin kindergarten in 2019-2020. Magnolia ISD has scheduled registration dates for children who will begin kindergarten in the 2019-2020 school year. 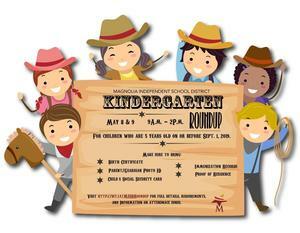 Kindergarten Roundup will take place at each of the elementary campuses May 8 and 9 from 9 a.m. - 2 p.m. Registration is come-and-go with no appointment necessary. Eligibility for kindergarten is for students who turn 5 years old on or before September 1, 2019, and reside in the Magnolia ISD boundaries. Click the picture to find out more details! Registration will not be accepted without copies of ALL the required documents.